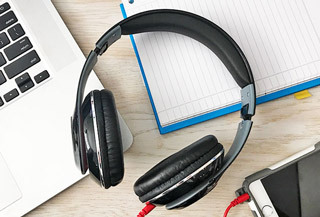 We're always on the lookout for a great pair of headphones. It can be a challenge when it comes to Bluetooth options...and it can be a tough balance when you're trying to find a pair that offers great sound and convenience. Not so with this pair. Get the 1Voice Sonic Bluetooth headphones for $22.99. You'll save 76% when you grab them at Escapist Deals. Yep, these babies are as comfortable as they look, thanks to the ear pads. You'll be able to listen to them comfortable for the entire five-hour playtime - and you'll get crisp, clear sound whether you're listening to music or picking up a call with the built-in mic. Track and volume control are built in too, so you never have to take out your phone to turn it up when the Hamilton soundtrack comes on. Meet your new favorite Bluetooth headphones. Get the 1Voice Sonic Bluetooth headphones for $22.99 at Escapist Deals.